Last Sunday we attended the 25th annual HaZamir gala concert at David Geffen Hall in New York's Lincoln Center. In previous years the performance was at Carnegie Hall, Avery Fisher Hall, and The Metropolitan Opera. 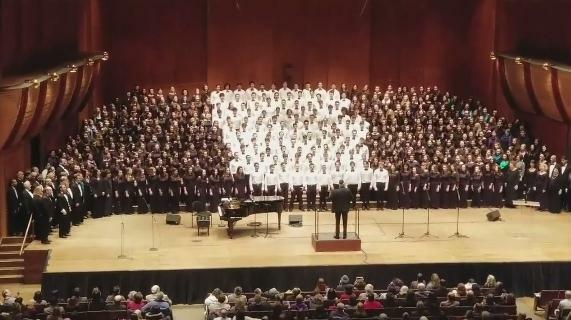 For two hours, 350 teenagers from 31 chapters of HaZamir Jewish High School Choir across the United States and in seven cities in Israel performed to a packed house, singing traditional and contemporary songs in Hebrew and English. HaZamir, the International Jewish High School Choir, is an international network of choral chapters for Jewish teens. Local HaZamir chapters meet weekly in cities across America and Israel to rehearse and perform Jewish choral music. HaZamir provides Jewish teenagers the unique opportunity to sing at the highest performance level, build pluralistic community, and create strong Israel-Diaspora relations in the next generation. Each local HaZamir chapter is directed by a talented conductor whose devotion to the highest standard of Jewish music-making helps to inspire the next generation of Jewish choral singers. This year the group paid tribute to Israel in its 70th birthday year and to Hazamir's own 25th anniversary. Today we're posting a short clip of their theme song, with which they begin and end their concerts, and Psalm 97 (Adonai Malach), composed by Steve Cohen and conducted by Chris Mason, conductor of HaZamir Westchester, accompanied by Scott Stein, conductor of HaZamir Manhattan on piano. Soloists are Benjamin Sokol, HaZamir Boston; Maya Behiri, HaZamir Long Island; Sam Joffe, HaZamir Silicon Valley; and Chloe Brown, HaZamir Miami. Outstanding performance. Can't wait for next year to hear the new concert. Thank you Al for sharing this beautiful music with us.